1. Center of the calcaneus. 2. Head of the 1st metatarsal. 3. Head of the 5th metatarsal. – Flexibility of the joints. – Strength, endurance and control of the muscles. Dysfunction of one or more legs of the foot tripod can lead to plantar fasciitis (heel pain), pain in the ball of the foot, bunions, hammer toes and numbness to name a few. Structural leg length discrepancies can cause lower back pain, amongst other complications. The body can compensate for this FUNCTIONALLY by increasing foot supination on the shorter side to equalise length. This is done by increasing downward movement and force under the head of the 1st MT, increasing the medial arch height.. compensating with your tripod. The tripod can also FAIL functionally and create a leg length discrepancy (pictured). When the head of the 1st MT has a weakened or inactive downward force. A uniateral pronated or flat foot posture could result. Can compensation for this occur higher up? Definitely! 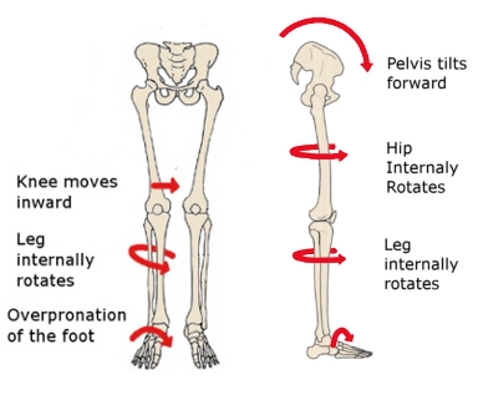 If ‘re-supination’ cannot be achieved to restore leg length, another compensation can come from the pelvis. If you anteriorly rotate the pelvis (ie the innominate rotates forward, bringing the ASIS forward) you can relatively increase leg length. This can be done favourably for one side and create pelvic torsion along with lateral tilt.